Tensions rise following the first death of a Turkish soldier at the hands of US-backed YPG Kurdish forces with whom American Special Forces are often embedded. The crisis in Syria has taken on another dimension with war being waged on several fronts among mixed allies and enemies after Turkey vowed to intervene more aggressively in the fight against Daesh (ISIS), but have trained their weapons instead on US-backed Kurdish forces out of domestic self-interest. The United States now finds itself aligned not only with the Erdogan regime, but also with Kurdish YPG forces considered by Ankara to be a terrorist organization aligned with the Kurdistan Worker’s Party (PKK), the latter of which aim to carve out a separatist stronghold in Turkey. President Obama’s delicate balance between the two opposing forces who share the mission of defeating and degrading Daesh in Syria appears to be collapsing following an intense offensive by Turkish forces that have left at least 70 people killed, the majority of whom are civilians according to local monitoring groups, in Kurdish dominated areas. The Turkish military, by contrast, claims that it killed at least 25 “terrorists,” the majority of which are believed to be Kurds rather than Daesh jihadists, claiming that they are taking all necessary measures to protect the safety of noncombatants. Regardless of whether the Erdogan regime struck civilian or military installations, the Obama administration now finds its soldiers stuck between the two sides – both of which are US allies. American Special Forces remain embedded with YPG forces who earlier this month helped to oust Daesh from the strategic enclave of Manbij less than 20 miles from the outbreak of Saturday’s airstrikes. Those same US Special Forces also work with their Turkish counterparts who they rely on for rear supply lines according to Wall Street Journal sources. The Obama administration now faces yet another major crisis in Syria with American Special Forces potentially in the crosshairs of Turkish bombing campaigns as the Erdogan regime seeks revenge against YPG Forces after the Kurds successfully struck a Turkish tank killing one soldier. The clash between Turkey and Kurdish forces is not the only mixed allegiance that the United States finds itself locked in at present as the Obama administration continues to provide arms and support to the so-called “moderate” rebel opposition to the Assad regime while engaging in bombing of al-Nusra Front (formerly al-Qaeda) terrorists – the only catch is that the rebels and al-Nusra Front have joined forces under the umbrella group The Army of Conquest. With yet another major military force drawn into Syria to conduct an operation focused on self-interest first and the fight against terrorism second, the question is now whether that delicate balance can be maintained or whether confusion over who each side is really fighting will turn chaos into tragedy. Turkish armed forces and Syrian rebels pushed Daesh out of Jarablus within hours, despite previous unsuccessful attempts to free the border town since 2013, prompting Syrian Kurds to suspect that something was fishy with Ankara’s military incursion into the neighboring nation. Abd Salam Muhammad Ali, a representative of the Democratic Union Party (PYD) in Russia, told Vzglyad that Turkish troops took control of Jarablus encountering almost no resistance. “Judging from how fast this ‘liberation’ took place, I have grounds to believe that this is a show. The militants shaved off their beards and rushed to join ‘moderates,'” he said. Abd Salam Muhammad Ali did not provide details on how the PYD plans to respond to Ankara’s activities in northern Syria. “Military leaders of the Syrian Kurdistan are most likely working on a plan to counter Turkey’s invasion. The only thing that I can say is that we are firmly against Ankara’s meddling in Syrian affairs,” he said. Turkey launched its offensive, formally known as Operation Euphrates Shield, early on Wednesday to cleanse the border area around Jarablus of Daesh and prevent the Syrian Kurds from advancing further west. Ankara maintains that both pose a major security threat to the wellbeing of the Turks. Rodi Osman, the head of Syrian Kurdistan’s representative office in Moscow, was also wary of how fast and easy the operation to retake Jarablus appeared. “If Daesh was not Erdogan’s ally, could [Turkish troops and Free Syrian Army fighters] seize the city within hours? The United States and others have to see Erdogan’s secret thoughts. We are persistent in pursuing our anti-Daesh strategy and will fight against the militants until the end. The international community needs to know the truth. As long as Erdogan stays there, Daesh will not go anywhere,” he said. Osman said that the Turks launched an operation in Syria in response to the victory of the Syrian Democratic Forces (SDF) in Manbij. The SDF, largely made up of Kurdish fighters, liberated the strategically important city on August 12 following a weeks-long operation. The official further noted that Turkey plans to take the border region in northern Syria under its control, but added that the Kurds will not let Ankara redraw the Syrian borders. The Jarablus area in northern Syria must be cleared of Kurdish militias, not only Daesh terrorists, Turkish Prime Minister Binali Yildirim has stressed. 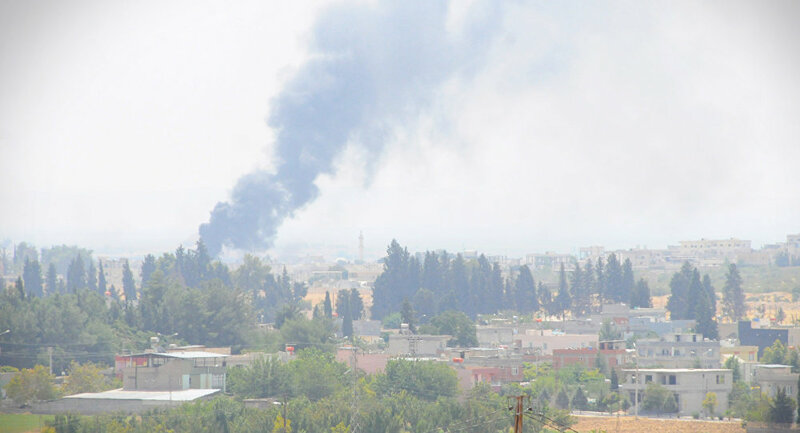 The Syrian opposition took control of Jarablus and has started to control other settlements in the area. But the entire area around Jarablus must be freed of the Syrian Kurds’ self-defense forces,” Yildirim said on Haberturk TV on Wednesday. Turkish President Recep Tayyip Erdogan said on Wednesday that the operation in Jarablus was aimed at stopping the threats posed by Daesh, as well as Kurdish militants in Syria, which Ankara considers to be linked to the Kurdistan Workers’ Party (PKK) branded a terrorists organization in Turkey. Syria’s Kurdish Democratic Union Party (PYD) co-chairman Saleh Muslim told Sputnik on Wednesday that the Turkish operation is designed to thwart the democratization of Syria. According to the local Kurdish authorities, at least 29 civilians were killed and more than 3,000 were forced to flee the northern Syrian town of Jarablus because of the Turkish airstrikes. 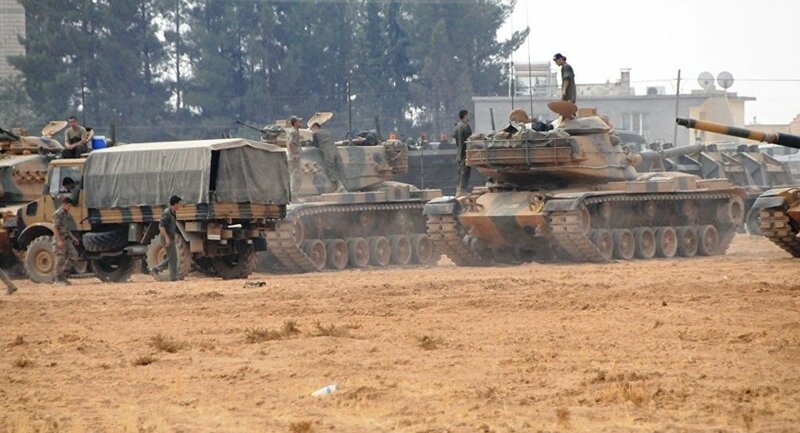 Local media reported on Wednesday that following the Turkish offensive Daesh militants were leaving Jarablus, which they controlled for over two years. Daesh is outlawed in a wide range of countries around the world.